If you would like a signed copy of this or any of my books, please call Bank Street and we will make that happen. THE BOY WHO LOVED MATH was named an Anne Izard Award winner. This is an award for storytelling given my librarians in Westchester County, New York. I was not able to go to the ceremony (I was on my way to Sardinia), but I sent my acceptance. Thank you to all on the committee! THE BOY WHO LOVED MATH won the Cook Prize. For details please visit the Bank Street page here. This one is special to me because the finalists were chosen by the Bank Street Book Committee, but then the winner was voted on by epsilons! Actual children. Paul would love that. The Boy is an Orbis Pictus Honor! It’s a New York Times Notable Children’s Book of 2013. I like how they talk about it on the podcast, too. The NYPL named it one of their 100 titles to Read and Share. Kirkus named it a Best Book of 2013. Booklist named it an Editors’ Choice for Youth 2013. Booklist named it a Top Ten Book About Science 2013. Tablet Magazine says it’s one of the best Jewish books of the year! Booklinks named it a Top 30 Title for K-8 Classrooms and Libraries. Check out The Erdös Number Project page. Do you have an Erdös number? Ron Graham, one of Paul’s best friends, has a cool page here. Watch out, if you click through to all the links and spend as much time there as you want, it will be tomorrow. Want to see some photos of Erdös? Go here. You’ll see what a great job LeUyen did capturing him. Speaking of capturing him, treat yourself to this wonderful documentary of Uncle Paul if you want to “meet” him some more. Want to make a Sieve of Eratosthenes? Want to see Paul as a dancing saint? Here’s a really good blog about math: Musings on Math. And here’s a wonderful blog on math and teaching called love2learn2day. I must admit she did a really nice review of The Boy! If you want to add to this list, please email me and then my website name. Also, please check below for some corrections. Want to play around with integer sequences? Go here! OK, now a little bit of braggy stuff. Fuse #8 blogger Elizabeth Bird gave her readers a “first look” at the book here. We love Betsy in this house. The New York Times math blog, NUMBERPLAY did wonderful feature about Erdos and the book the week of his 100th birthday. Here it is. Check out this GREAT review on Boingboing! And, The New York Times ran great review by none other than Nate Silver! – read it here. THE BOY has gotten three starred reviews from journals. “Though eccentric mathematician Paul Erdős might seem an unusual subject for a picture book, his story makes for a memorable biography. Growing up in Hungary during World War I, Erdős tried school but chafed at the rules and convinced his mother that he should study at home. He was fascinated by numbers from an early age, and by the time he was 20, he was known as “The Magician from Budapest.” Unable to do common tasks such as cooking, laundry, or driving, he spent his adult life flying around the world, staying with other mathematicians, and working collaboratively on challenging math problems. Math is woven into the lively writing (“Mama loved Paul to infinity. Paul loved Mama to, too!”). The wonderfully vivid artwork, where ideas from the text are clarified, also uses decorative elements to support the idea that Erdos saw the world differently—numerically. Heiligman appends a lengthy note about writing the book, while Pham offers a more extensive note on creating the illustrations, in which she comments on the mathematical ideas and mathematicians depicted in the art. This excellent picture-book biography celebrates a man little known outside his field, but one well worth knowing. "—Carolyn Phelan— Booklist, starred review. “As a boy in Budapest, Paul Erdos (1913–1996) had problems to solve, but they didn’t involve math. Rules were a problem, and school was another: “Paul told Mama he didn’t want to go to school anymore. Not for 1 more day, for 0 days. He wished he could take days away—negative school days!” Heiligman and Pham cleverly incorporate mathematical references through this story, which follows Erdos from a numbers-obsessed boy to a numbers-obsessed man who flouted societal norms and couch-surfed the globe—other mathematicians were honored to have him as a guest for the chance to talk math with him. Erdos’s unconventional brilliance shines through on every page, and extensive author and illustrator notes (including Pham’s explanations of the mathematical concepts she works into each illustration) will delight readers with even a fraction of Erdos’s interest in math.” — Publisher’s Weekly, starred review. We have been fortunate to get some gorgeous reviews and blog posts. Here are a few: From Kirkus and it’s called Math–All Day, Everyday! Click here, and thank you, Julie Danielson!! An amazing review from the Mathematical Association of America’s magazine: HERE. Heiligman, Deborah. The Boy Who Loved Math: The Improbable Life of Paul Erdos. Illus. by LeUyen Pham. New York: Roaring Brook, 2013. 44 pp. $17.99. (9781596433076). K–3. What if you spent every waking day so engrossed in a single pursuit, so immersed in your life’s passion that you had little time, or interest, in learning anything else: how to cook, pay bills, do laundry, or even butter toast? Such is the story of eccentric Hungarian mathematician, Paul Erdos. For Erdos, who published more than 1,500 math papers, time not discussing number theory and combinatorics was time wasted. 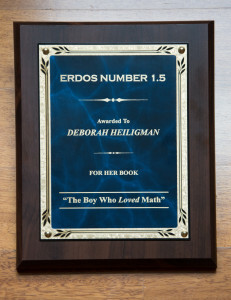 In The Boy Who Loved Math, Heiligman traces Erdos’s unconventional life from his early childhood obsession with numbers (he could instantly calculate how many seconds a person had lived based on birth date) to his vagabond-like, academic globetrotting. He would show up on other mathematicians’ doorsteps in the middle of the night to stay and work, greeting each with his familiar salutation, “My brain is open!” A man known for having few possessions and living out of two small suitcases, Erdos gave many monetary awards to the poor and set up prize money to be given to those who answered unsolved math problems. He is perhaps most noted for advancing the field through his frequent collaborations with other lovers of numbers. In the acknowledgments a few names were misspelled. They were corrected in subsequent printings. But if you have a first-printing: Jerrold Grossman’s first name is, in fact, Jerrold. These are the correct spellings of three other names: Richard Schelp, Ioana Dumitriu, and Debbie Golomb. Oh and one more thing: Please go here for a really fun comic about love and Erdos. © Deborah Heiligman. All rights reserved.